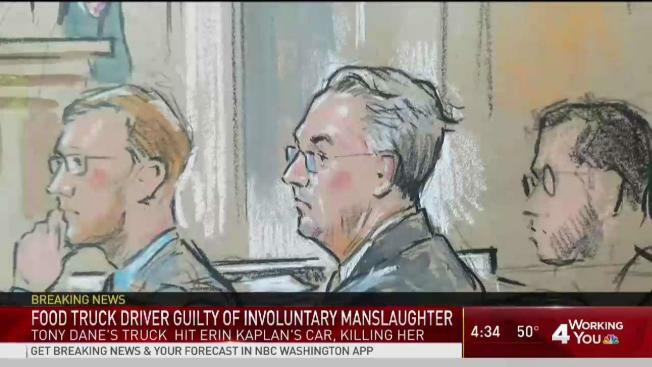 The food truck driver who crashed into a family's car in Northern Virginia last fall, killing a woman, has been found guilty on five counts, including involuntary manslaughter. A jury made their determination in the trial of Tony Steven Dane on Friday afternoon. He could seve as much as 12 years in prison. Driving a red, converted school bus for his company Dane's Great American Hamburger, Dane ran a stop sign on Evergreen Mills Road in Leesburg, Virginia, about 4:50 p.m. Sept. 8, 2017, police said. The food truck slammed into a Audi station wagon carrying a family of five. Erin Kaplan, 39, was killed. 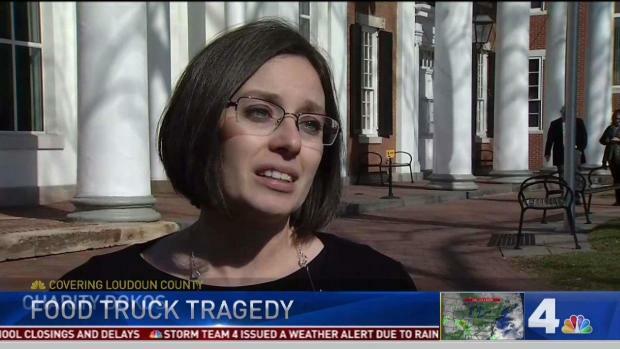 Her teenage son, Ben, her two daughters and her mother also were hurt. Outside the courthouse, Erin Kaplan's widower, Faran Kaplan, said he felt justice had been served. Still, nothing can bring back his wife. "Just tell your wife how much you love her every chance you get, because you just never know when you're not going to get to do that anymore," he said, starting to cry. Dane's defense attorney characterized the crash as a horrible accident that also destroyed Dane's family. His wife took the stand and said he was not sleeping and had lost 50 pounds. Prosecutors called his food truck a 22,000-pound "ticking time bomb" and said Dane knew he was operating with bad brakes. Also, he was driving without a license, without an inspection and without insurance. Witnesses gave emotional testimony earlier this week about seeing the devastating crash. 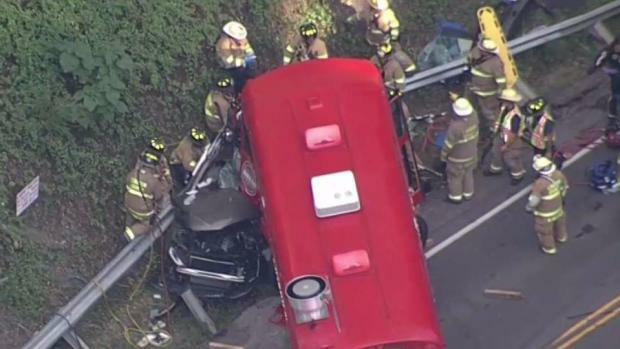 Chopper4 video shows a red bus on top of another vehicle in the area of Evergreen Miss Road and Watson Road in Loudoun County, Virginia. "It's still very difficult to deal with. 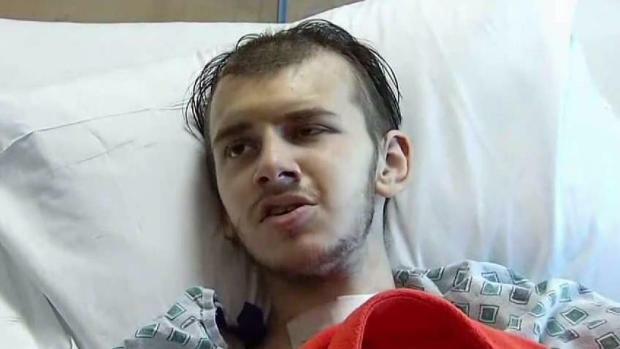 That family has gone through so much," Sarah DeWees said, her voice trembling. DeWees was traveling right behind the Kaplans when she saw the red food truck barrel through a stop sign and T-bone the car. "It was just absolutely horrifying," she said. "It was like slow-motion and happening so quickly at the same time. You just saw the front end of a car go away," she said. Erin Kaplan, who was at the wheel, was killed instantly. A second witness said the food truck came within inches of children stepping off her school bus. Bus driver Charity Dokos had just stopped to drop off two children. She checked her mirrors and saw a potential disaster in the making; the food truck was barrelling toward her bus. The man behind the wheel when a food truck slammed into a family's car in Ashburn in September, killing a woman, is now on trial. 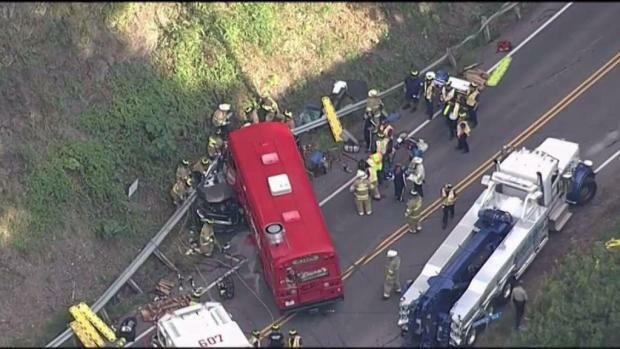 Witnesses of the deadly crash testfied Monday. "It was like slow-motion and happening so quickly at the same time. You just saw the front end of a car go away," Sarah DeWees said, her voice trembling. 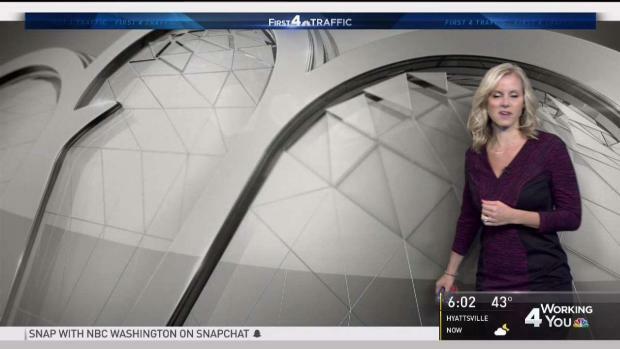 News4's Julie Carey reports. "My students were halfway in the middle of my lane. I thought he was going to slam into me, and by the speed and the force, I thought I was going to run over my own kids. At the last second, he went off to my left-hand side to oncoming traffic," she said. Moments later, the fatal crash occurred. Dokos still drives through the intersection twice a day. "It is a sick feeling in the pit of my stomach, and I will tell you, both those times during the day, I just pray for the people involved," she said. Dane's Great American Hamburger was based in Winchester, Virginia, and was founded by Dane. He is a father who initially bought the school bus he later converted into a food truck so he could travel with his family, the business' website previously said. The site has since been taken down. It wasn't immediately clear if the company still operated. Dane also is a conservative activist who was charged in 2016 in Nevada with trying to extort a state lawmaker into changing his vote for Assembly speaker, The Associated Press reported. A grand jury indicted the operator of a food truck on an involuntary manslaughter charge after a crash that killed a mother of three in Virginia. The crash and Erin Kaplan's death stunned the community, which raised tens of thousands of dollars to help with the family's medical costs. Ben Kaplan said he was grateful for that support. After the deadly crash, the Virginia Department of Transportation made safety improvements at the intersection of Watson and Evergreen Mills roads, and the Loudoun County Sheriff's Office hit the area with a special enforcement campaign. Erin Kaplan's widower attended the trial with a therapy dog he now has to help him through difficult times. Ben Kaplan is back in high school and is expected to graduate on time. His father called him "my miracle."